Challenger banks like Monzo and Starling are rapidly growing their market share. This survey examines why. 14% UK bank customers across all age groups now have at least one mobile-only digital banking provider. Challengers are popular with Gen-Zs and Millennials: 1 in 4 under 37s are using digital-only challenger banks. 61% of UK bank account customers are thinking about opening an account with a new provider in the next three years. This trend increases with Millennials and Gen Zs, with 75% looking to open a new account in the next three years. 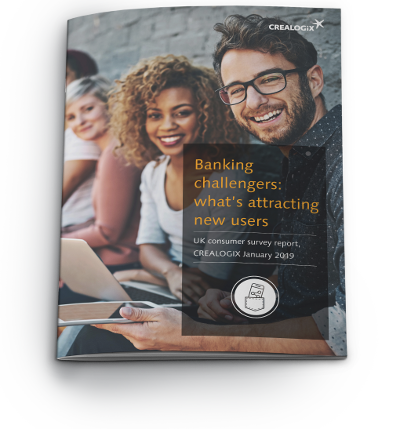 CREALOGIX conducted consumer research with 2,000 current account holders in the UK to discover people's attitudes towards opening new bank accounts. We analysed what attracts people to sign up with new challengers as opposed to established high street banks. Are consumers active in opening new bank accounts? What might attract people to open a new bank account? What proportion of people have opened accounts with mobile-first challengers? What do users of banking challengers say that they like about them? When people open new bank accounts, do they close their old/previous account? Fill in the form to download the free report and see what we found out.